“Mens Sana in Corpore Sano,” or “a sound mind in a sound body,” was the motto for the Athletic Association of the University of Pennsylvania. The association traces its roots to a society formed in the fall of 1873 by freshmen, sophomores, and juniors in the college. An Athletic Association has been organized for the promotion of manly exercises, which has admirably accomplished its purposes. At the first series of contests, prizes were given for the best running, ball throwing, batting, etc. The contests were very close and interesting, the day’s sports being closed by a foot-ball match, ’74 and ’75 vs. ’76 and ’77. This Athletic Association focused primarily on the promotion of track and field. Other sports such as baseball, cricket, football, and rowing were already organized both as class competitions and at the intercollegiate level, and each of these sports was already managed through its own association. At this time, Penn did not have its own track, or even an athletic field. 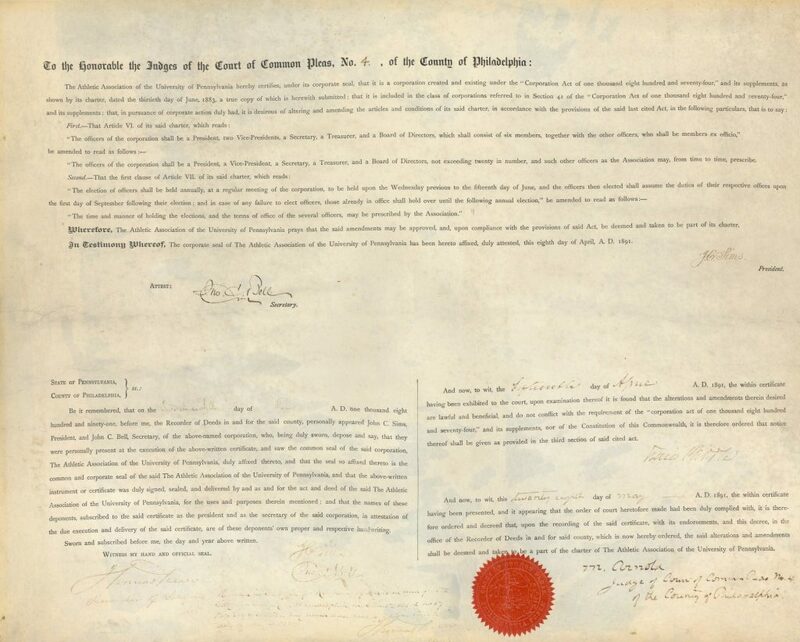 The Athletic Association did not become powerful enough to truly reach its goal of promoting track and field at Penn until 1879 when it, for the first time, allowed Penn graduates to join its ranks. These graduates helped to provide financial stability for the association as well as help direct the association and administer its events. In 1882 the Athletic Association made changes that expanded its jurisdiction, membership and financial resources. The Athletic Association became the one governing body for all Penn sports by opening its membership to athletes not just in track and field, but in all sports on campus. That same year alumni took a leading role in the shaping and governing of Penn athletics when several Penn graduates formed a corporation titled “The Athletic Association of the University of Pennsylvania.” Immediately thereafter, the first officers as well as the first chairmen of standing committees of the Athletic Association were elected. This new organization included current students, but also shifted power from these students to the alumni. In return students benefited from greater stability in athletic programs and their financing. According to the formal incorporation of this reorganized Athletic Association in the fall of 1883, the Board of Directors, the Athletic Association’s central decision-making body, was to be made up of nine alumni and eight undergraduate students, all elected by the members of the Athletic Association. This Board of Directors was responsible for the appointment of committees to oversee each individual sport, each committee consisting of two alumni and three students (including the team captain and manager). The Board of Directors also appropriate money, employ coaches and trainers and the caretakers of the training house, athletic grounds and boat house. The University Trustees were entitled to two representatives on the Athletic Association Board of Directors; University Trustee approval was necessary before the enactment of any change in the Athletic Association by-laws. During the early 1880s the alliance of the Athletic Association, Provost William Pepper and the University Trustees led to the organization of a preliminary physical examination for all entering undergraduate students and of an undergraduate physical exercise program. This examination and exercise program were placed under the control of the Faculty, while the administration of competitive athletics was left in the domain of the Athletic Association. The stature of the Athletic Association grew as John C. Sims and other alumni worked with Provost Pepper and University Trustees to build the University’s first athletic fields. The grounds, built on the corner of 37th and Spruce streets at a cost of $15,000, opened on May 11, 1885. They included a baseball diamond, a track, a level playing field and covered grandstands–all as good as those available at other colleges at that time. Due largely to the influence of the Athletic Association, athletics had become such an important part of University life that when the building of dormitories closed down the athletic grounds at 37th and Spruce streets, the Board of Trustees authorized the building of a new facility at 33rd and Spruce streets. Franklin Field, at 33rd and Spruce streets, was officially opened to the public on April 20, 1895, during the first annual “Intercollegiate and Interscholastic Relay Races,” now known simply as “The Penn Relays.” The new training house was added to this site in 1904 in order that the entire student body could have the opportunity for adequate physical training. The Athletic Association brought the first trainers and coaches to the University in the late 1880s and 1890s. The earliest Penn athletes trained and strategized on their own, electing their own managers and captains to organize their competitive events. Except for crew coach Ellis Ward, the first coaches of Penn athletic teams did not appear until at least the mid-1880s and were usually graduate students who had been players during their undergraduate days. They were gradually replaced by more expert coaches who were committed to earning their livings in their respective sports. Yet during the nineteenth century, even these professionals were not full-time Penn coaches; they sometimes trained athletes in other sports during the off season, worked with other teams outside the University, wrote training manuals, carved oars, ran summer camps or did whatever else was necessary to support themselves and their families. Crew: In 1879 Ellis Ward began training Penn rowing crews. A professional rower who did not attend college, he stayed at Penn, with only two short breaks until 1913. Football: In 1885 Frank Dole became Penn’s first football coach, followed in 1887 by Ellwood O. Wagenhurst (then a Penn law student). The first non-student football coach was George Woodruff, who arrived at Penn in 1892 and left in 1901. Track: In 1896 Mike Murphy became the first professional coach to train Penn’s track athletes. Baseball: In 1893 Arthur Irwin was mentioned as coach of the baseball team, to be replaced in 1896 by Jesse H. Allen, a Penn medical student who had played professional baseball. The next coach, Dr. William H. Murphy, a former Yale University shortstop and the brother of legendary “Mike” Murphy, was with the Penn team in 1898 and 1899. In the early 1900s Roy Thomas and Jackie Coogan, former Penn baseball players who had gone on to play professional ball, returned to coach at their alma mater. 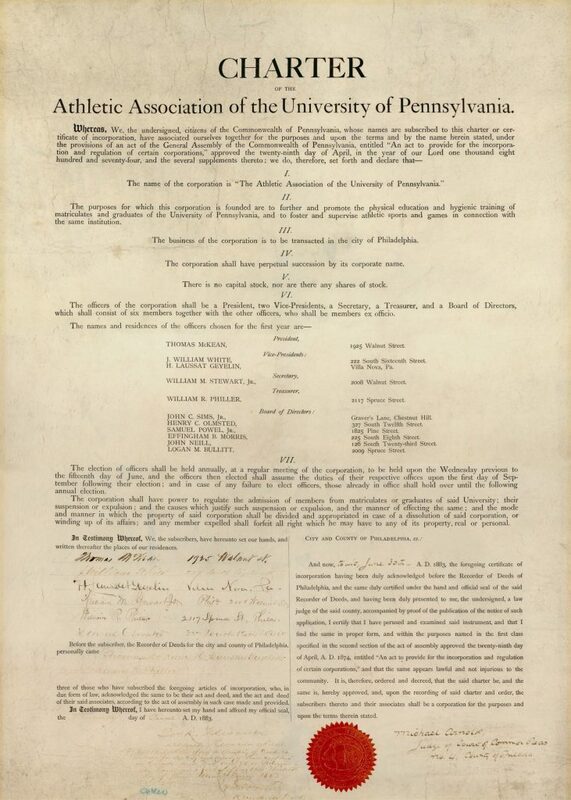 In 1893, the Athletic Association worked with a Penn faculty committee to develop the first formal eligibility rules for Penn varsity athletes. 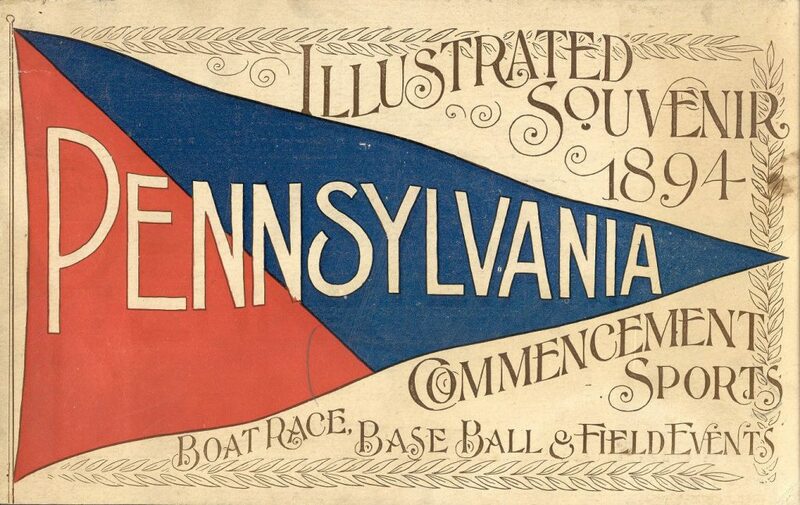 By 1900 the basic ingredients of Penn’s twentieth century college athletics had taken shape. The organization was in place to handle athletic facilities, coaches, financing, and regulation at all levels, from undergraduate physical conditioning to intramural competitions to intercollegiate athletics. The Athletic Association had played a key role in the evolution of Penn sports from its humble, informal beginnings to its major role in University life.